We all know the usual suspects: Craigslist. Monster. Career Builder. Newspapers (half-kidding on that one). Or perhaps you’re more of a networking kind of person when looking or hiring for a job: frequenting marketing events to get some face time with heavy hitters who might want you to join their teams. Marketers — or anyone — looking for work have probably spent time in all of these places at one time or another. But like … what else? Those can’t be the only ways to find a new job. Or, if you’re looking to hire someone, to find your next great team addition. To paraphrase every infomercial ever, there’s gotta be a better way. Below, you’ll find 11 places you might not have thought of, but often prove to be excellent marketing venues for finding job openings and the candidates to fill them. Mashable isn’t just a mashup of news content you need to know about today. Amid the entertainment, culture, tech, science, and social good sections, this bright-blue media outlet also happens to be a job site. 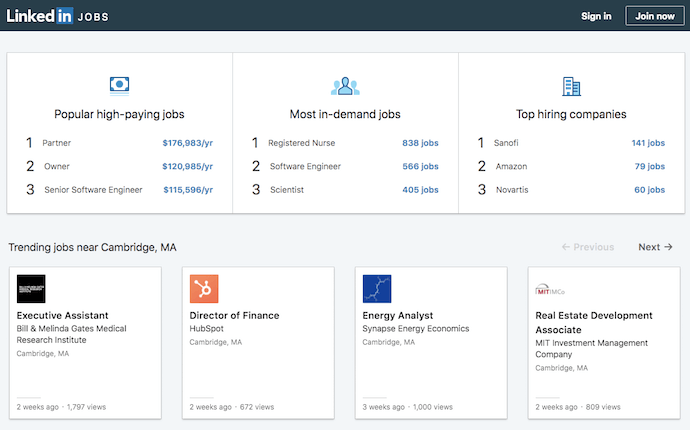 If you’re job hunting, there are several ways to browse current job openings from the dashboard shown above. To start, you can simply type keywords related to your job into the blue search bar. You can also search by employer (if you have your heart set on that one company you’ve always wanted to work for). 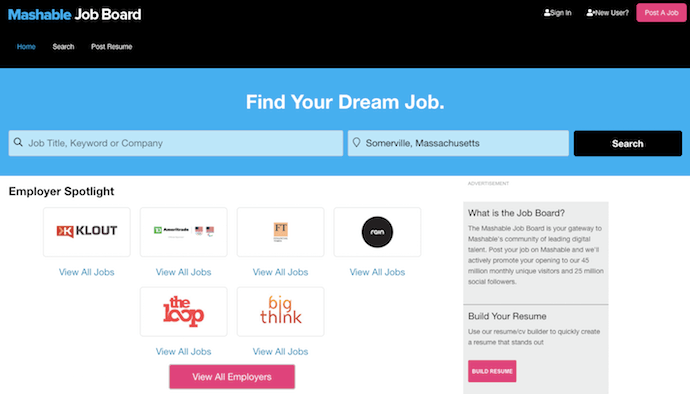 If you’re an employer trying to expand a job opening’s reach, click that big pink rectangle in the top-righthand corner of the page. Mashable’s job site is dedicated to jobs in social media, marketing, technology, and business. And they post for companies that are, well, kind of a big deal — like Yelp, Viacom, and Digitas. The AMA is a well-known and respected marketing association that publishes content and hosts networking and teaching events that keep members up to date on what’s going on in the world of marketing. The positions there range across many sub-specialties in marketing and across many different industries. Those looking to recruit candidates can also post jobs at a discounted rate if they’re an AMA member. Another added benefit of the AMA jobs board? It also offers educational resources like resume writing tips, information about reference checking, and how to use social networking in your job or recruitment search. Speaking of social networking … you didn’t think we’d neglect the holy grail of social recruiting and job hunting, did you? LinkedIn is unbelievable if you’re looking for a marketing job. Seriously, I can’t state it enough. It. Is. Awesome. 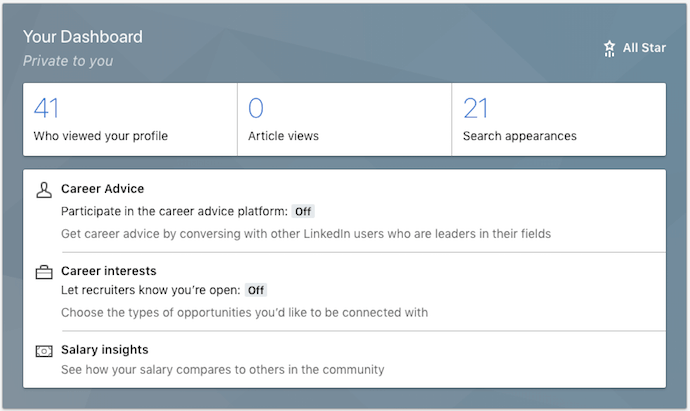 LinkedIn Jobs lets you search for jobs by industry and location, plus it suggests jobs you might be interested in based on the information in your LinkedIn profile, such as where you’re located and the experience you already have. If you haven’t already, fill out your LinkedIn profile as completely as you possibly can. They make it foolproof, too, including a progress bar that tells you how complete your profile is, what more you can do to beef it up, and why doing those things will benefit you. Don’t feel bad about stalking — it’s business stalking. For instance, LinkedIn has a groovy feature that lets you see who has been viewing your LinkedIn profile (provided your privacy settings are set so others can see when you’re viewing their profile). Want to see exactly who’s been viewing your LinkedIn profile? LinkedIn Premium shows you exactly who might be interested in you as a professional. Whether they’re recruiters, HR managers, or work for a company you’ve been eyeing, this visibility enables you to reach out to them proactively. If you’re one of those people who prefers face-to-face networking, you can also leverage a tool called LinkedIn Events. This allows you to see who on LinkedIn is attending industry events — if your hopeful future boss is going, it might be a good idea for you to show up, too. If you’re vying for a specific company, follow that company on their LinkedIn Company Page. Not only will you be able to get a feel for what the people that work there are like and what their employee turnover and promotions looks like (just go to the ‘Insights’ tab), you might see new jobs pop up, too! Or if you’re not looking to join one company in particular, consider joining some inbound marketing groups to establish your name as a thought leader — and get to know people who are hiring, or know people who are hiring. We recommend a little group called Inbound Marketers – For Marketing Professionals. Follow specific jobs Twitter accounts. 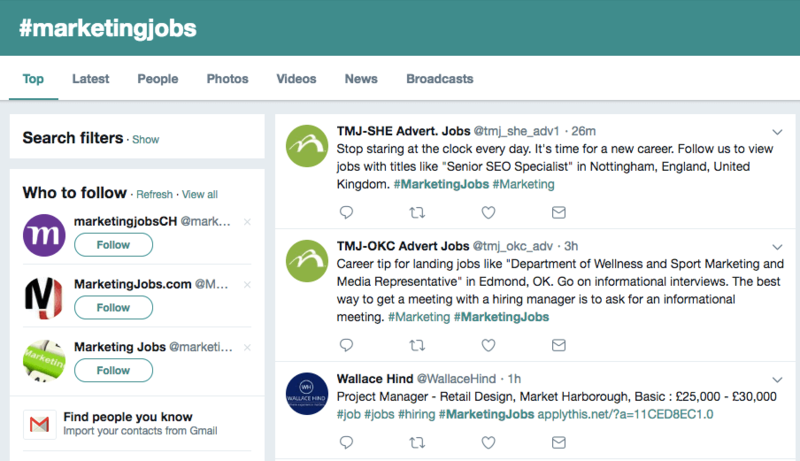 Do a quick search for “inbound marketing jobs” or “marketing jobs” and you’ll come across tons of Twitter accounts whose sole job is to tweet out open roles in our fine industry. Follow specific jobs hashtags. You know what else you might find when you conduct that search? Hashtags associated with those jobs. Hashtags like #marketingjobs or #jobsearch are good places to periodically check in for recent opportunities. Follow the companies you want to work for, and the people who work there. Look for job postings that come from them, particularly if these companies have a referral bonus. At HubSpot, for instance, many employees take it upon themselves to tweet out new jobs because, if they bring in a new hire (even from Twitter), there’s a nice referral bonus at the end of the tunnel. You’ve never seen something like job.com, I can assure you. This intriguing recruitment site uses blockchain technology to match candidates with employers based on the attributes both parties are endorsing. Although it caters to professionals in every industry, job.com is a perfect fit for writers, optimizers, and analysts who leave no stone unturned when advertising themselves to a new employer or candidate. In other words, if you love optimizing your resume or job listing with specific language that appeals to professionals like you, you might want to give this site a try. Doesn’t this job site sound like a recruiter’s dream? Talent Zoo does indeed have a zoo of talent — and job listings in need of that talent — specifically for marketers, advertisers, designers, and even web developers. In addition to a place to upload a resume for repeat use, the site has a slew of articles offering career advice to help employers and applicants put their best foot forward when reaching out (and, ultimately, working together). Talent Zoo also takes a playful approach to its user experience — you need not look further than its search button, “Bring It, Daddy-O!” If you or your company culture is just as casual, posting to this site can ensure both parties would be a fit for each other on a social level. Not shy about its commitment to contract workers, Mediabistro also reserves a section of its website for freelance — accessible from the top navigation bar. There, you’ll see a database of freelancers across each of the industries listed above where you can find a professional that’s perfect for the work you need done. Are you a freelancer, yourself? Become a Mediabistro member and create a profile. You might associate Behance with downloadable design templates, creative tools, and collections of artwork. 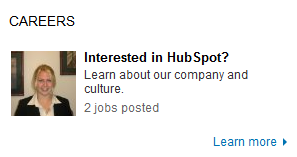 But where would Behance be if it didn’t also help find employment for the people who seek inspiration on its website? For that, there’s Behance’s job list, which surfaces job listings across dozens of industries that depend on creative professionals. What really sets this job site apart from other creative recruitment platforms is its company profiles. Inside each job listing is a project page for the company that posted the job. The employer can list current projects they’re working on, who’s following them, and even their most active team members. It’s a great way to get to know companies and candidates as individuals so they don’t become just another application. This job site tells you precisely what it is in its name. Want to be a professional blogger or find writers to create content for you? 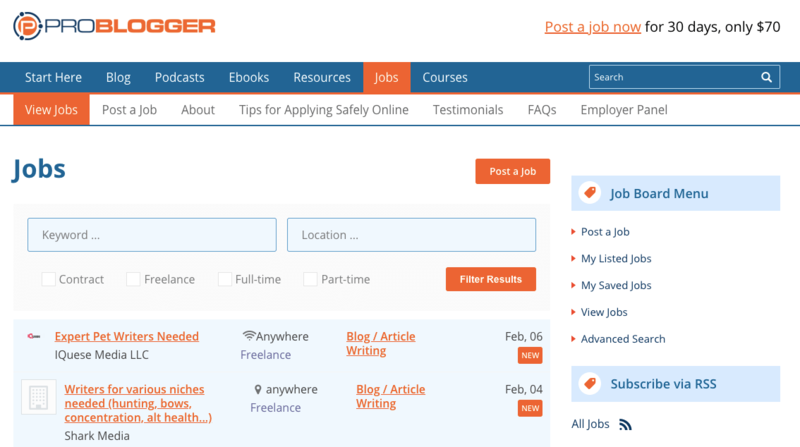 ProBlogger makes it easy for companies and candidates to find each other for various content marketing initiatives. Jobs are clearly sorted by contract, freelance, full-time, and part-time. It can be hard for startups to attract awesome talent on big recruitment sites like Indeed or even LinkedIn, especially when they’re competing against big brands for exposure. But there are millions of skilled professionals who want to work for startups but just can’t find them. That’s where AngelList comes in. 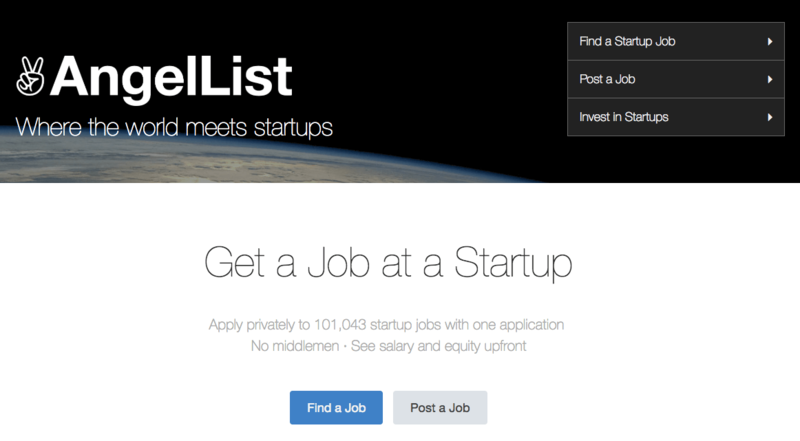 AngelList is a job site exclusively for startups and those who want to work for them to find each other. Growing companies like DuckDuckGo, a search engine; Asana, a productivity tool; and Hinge, a dating app, all find top-tier talent on this job site. Why wait for someone else to post a job listing? Take matters into your own hands. Marketers can be notoriously bad at marketing themselves, but if you’re really good at marketing, why not use your skill to your own advantage? If you want a new job, help yourself get found all on your own. Think of your job hunt as its own marketing campaign. In fact, we’ve had plenty of our own inbound marketing hires execute full-fledged inbound marketing campaigns to get the attention of recruiters, hiring managers, and even recruiters here at HubSpot. No matter how hard a time you’re having finding a new gig on third-party sites, remember that you always have you to fall back on. Click here for more job sites that are particularly helpful for recruiters, and sign up below to learn how to become your own best professional advocate.